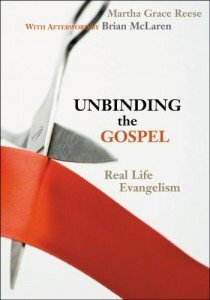 I’ve soaked up reading Unbinding the Gospel: Real Life Evangelism (Real Life Evangelism Series) by Martha Reese. She did a survey study of over 1000 mainline churches to observe what churches were doing in evangelism. It covered the full range of theological perspectives from conservative to progressive to outright liberal (self definitions, I guess). That can be interpreted in several different ways from just adding members, or generating conversions. I’m sure that there are some churches that simply help people join — irrespective of a relationship with Christ. I’ve not had the opportunity to drive down into the definition. To me, that’s a no brainer, and perhaps to Ms. Reese it was to0. The research she did supported that. (According to Reese, many mainliners do not know how to talk about their faith, and the research shows it. They love God and love the church, but are fearful when it comes to talking about faith). I think there are several reasons. some might be as simple as not knowing how. Others answers may be more complicated. We live in a society that discounts biblical Christianity and anything that smacks of evangelism. I’ve heard it said that evangelism is a word that both the non-Chrisitan and the Christian are afraid of. We need good models who live out their faith in word and deed. We need skills in relating to people and knowing when the proper time is to “take the plunge” into a spiritual discussion. we may also need some boldness. I do have a concern in the terminology for evangelism that the author uses. While I want to recongize that there are actions and prayers and other things we may do that is not directly sharing our faith, it shoud lead to sharing our faith. (like: http://www.mostimportantthing.org) I was one of those people who joined a church, but really had not saving, living relationship with Christ. I lived under the assumption that since I was a church member, I was going to heaven and right with God. I was not. I needed someone to talk to me about my personal relationship with God before I realized my need. so, I believe the definition is good as far as it goes, but if it would add, with the intent of the person coming to faith in Christ, that in my opinion would be better. Looks like I’m going to need to read her book. Thanks a lot. Blessings to you.